Steven Van Belleghem recently told me that AI resides at the heart of all the latest evolutions in technology: “it’s what the sun is to our solar system”, he boldly stated. He’s certainly not the only one to believe that it’s the bedrock of our future. Andrew Ng has called it the “new electricity” while Google CEO Sundar Pichai even went beyond that: “artificial intelligence is going to have a bigger impact on the world than some of the most ubiquitous innovations in history”, like electricity (sorry Andrew…) and even fire. So, I feel pretty confident to state that AI will lie at the basis of the (re-)development of business, and even society in general. If the world wide web built the substructure of the age of networks and disruption, then AI will drive the same type of revolution in the cognitive age. Google, Apple, Facebook, Amazon, Alibaba, IBM: everyone is racing to get a piece of that very delectable and rich pie. But who will win the race? When I visited China a few months ago, literally every company was talking about AI: it was deeply rooted into their products and services. Health company iCarbonX told us they wanted to become the analytical engine behind all the hospitals, health apps, doctors, insurance companies, fitness clubs, etc. to solve their ambition to “rid mankind of disease”. Ingdan showed us they wanted to build a platform to unite all the possible players in the field of AIoT: a smart combination of the Internet of Things with AI. We visited Tencent, that recently opened an AI lab in Shenzhen with a vision to “Make AI Everywhere.” Electric car pioneer Nio recently unveiled its autonomous concept vehicle, the NIO EVE which allows its passengers to interact with an “artificial intelligence engine” called NOMI to control the vehicle (although the car can be driven manually if needed). In the beginning of last year, Ubtech robotics announced the largest artificial intelligence funding in history, with a $820 Million in Series C Investment. Let’s not forget Alibaba, that invests in countless AI start-ups like SenseTime as well as in seven AI-driven research labs. China VCs invested 4.7billion in AI this year while America VCs invested ‘only’ 4 billion. I could go on, but I think I’ve made my point, here. There are two main reasons for China’s extreme eagerness in this fast and broad adoption of AI. The first is obviously the push of the government and the Big BAT (Baidu, Alibaba and Tencent) as well as TMD (news app Toutiao, group-buying service Meituan-Dianping, and ride-hailing firm Didi Chuxing). AI plays a huge role in China’s ‘Made in China 2025’ blueprint and it vowed to become a global leader in the AI field by 2030. The very first step of that plan is to catch up with the US on AI technology and applications by 2020. Investments in AI education - of which the plan to build a $2.1 billion AI technology park in Beijing is a beautiful example – are playing a pivotal role in that. 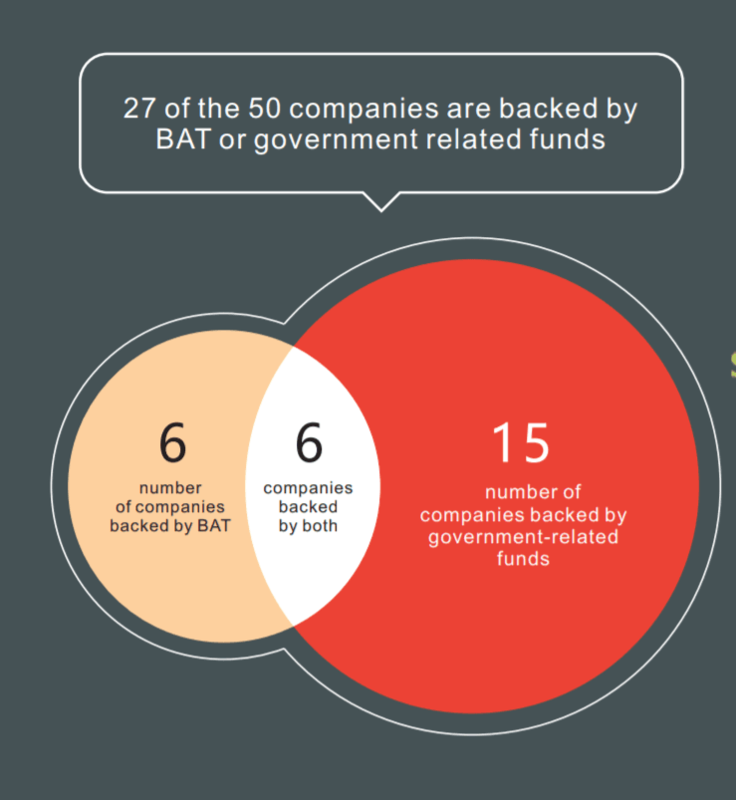 The BAT, in their turn, keep investing in small(ish), agile and promising AI startups to help them conquer the world. Tencent invested in UBTech, Camesense, Human+, XKool, iCarbonX, VIPkid. Alibaba in iDriver+, the City Brain project, SenseTime, AISpeech, Cambricon, Xiaoyi Robot, Megvii and Orbbec. Baidu in Kitt.ai and knowbox. Now the important second driver in China’s AI race is data. China is extremely customer driven. This mindset is deeply engrained in the DNA and the culture of Chinese companies that puts the customer first above anything else. The reason is very prosaic and purely revenue driven: give the customer what (s)he wants and (s)he will buy. And the way best way to achieve that is by letting his or her data - the fuel of AI - tell you what (s)he wants. And if there is one thing that the Chinese - all 1.42 billion of them (more than 18 % of the world population) - have aplenty, it’s data. Now let’s put 2 and 2 together. If AI is the fundament or the engine of our future; if it’s going to have a bigger impact than ubiquitous tech like electricity or fire AND if China is winning the race fort AI, then the latter will be in control of a large chunk of our future. Though AI has been developing and growing for years now, it’s still very much in a seminal stage. What has changed, though, is that we now have the computing power to make it work and we’re currently experiencing how it is evolving at high speed. This is the right moment to get in at the ground level and gather market share. Just like a few giants like Google, Facebook, Tencent have “won” the (social) internet by being there first and profiting from the networks effect, China knows this is AI’s time. That’s the exact reason why – another insight I received from Pascal Coppens – China is leading the world in ‘practical usage’ real-world applications: like conversational AI, self-driving cars, medical record analysis or contactless payment shops. Pretty smart in two ways. First, deploying AI in the market helps continuously improving the algorithms, which is why Chinese algorithms trump (DYSWIDT?) those of the US. No surprise then, that Shanghai based Yitu Tech won first place in the face identification accuracy contest in the first Face Recognition Prize Challenge hosted by the Intelligence Advanced Research Projects Activity (IARPA). And, secondly, just as important: Chinese companies are very pragmatic and consumer-driven which is why they develop AI products that they can use and sell now (instead of building expensive AI experiments that are about developing new markets and which will take a long time to gather revenue). Silicon Valley does that too, obviously, but it’s investing a lot more in the (very) long term with high-prestige experiments like Google’s artistic Magenta project or IBM’s Alphago. Nothing wrong with that, obviously, except that China will probably have won over large parts of the market when AI, and its experiments, have finally grown to maturity. And it’s very hard to reclaim a market from a category king. It reminds me of Tim Harford’s "toilet paper principle", too: once a technology is cheap enough to wipe your bottom with, it’s cheap enough to change the world. Compared to the US, China is actually developing and selling the affordable "cheap stuff”, changing the world one AI application at the time. This is the eve of the cognitive AI age, and those who understand that they need to lay the groundwork now, will be the winners of the era. Will you? Laurence has more than 10 years of experience in marketing, communications and disruptive innovation. Passionately curious, she is fascinated by the impact of technology and science on the way we work, consume and live our lives. Alibaba's 'new retail' revolution: what is it, and is it genuinely new?